Every year I seem to discover something new about Groundhog Day. Reading about Punxsutawney Phil last week, I ran across an interesting tidbit. It seems that the Ancient Romans used a different kind of “hog” to predict the coming of spring—a hedgehog. Perhaps one not unlike Sassafras, the hedgehog who lives behind the check-out desk in the Children’s Department of the Putnam County Library. Eager to know more, I recently spent some time hanging out with Sassafras and her caregivers and learned some really cool stuff. Bob Tarter, who presents a wildly popular animal show during the Summer Reading Program, suggested that the library consider taking on a pet hedgehog. It would, he said, provide the staff something unique and interesting to share with patrons. And indeed it has. Amanda Yother, Children’s Services Coordinator, told me that Sassafras has been a major hit, despite the fact that she prefers to sleep all day and–like most hedgehogs–has no interest whatsoever in being cuddled. Hedgehogs have a lifespan of 4-6 years in the wild, longer in captivity. Sassafras is 18 months old. She’s about six inches long and weighs less than a pound. Hedgehogs prefer to live alone and will often fight if caged with other hedgehogs. 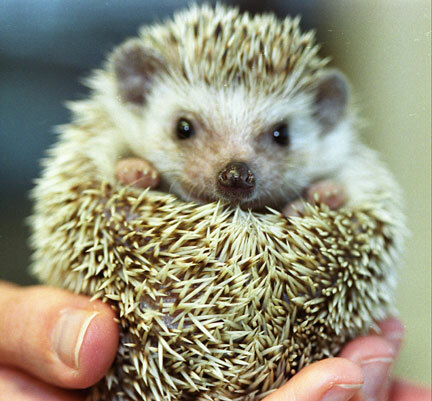 Pet hedgehogs are usually fed a diet of cat foot supplemented with insects. They love an occasional treat of mealworms. When frightened, hedgehogs will sometimes bite or scratch. That’s why Amanda doesn’t pass Sassafras around the room to be petted. Another fright tactic is to roll into a ball so that its stiff protective spines completely cover the outside of its body. But hedgehogs don’t “shoot” their spines like porcupines shoot their quills. Hedgehogs aren’t quiet. When riled up, they hiss, growl, squeal and chirp. Hedgehogs like to sleep all day and party all night. Making the windowless, pitch-black-dark basement of the Putnam County Library a perfect place for Sassafras, who begins perking up just as the library is closing for the evening.